^ Kane, R.P. (2002). 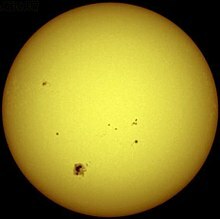 "Some Implications Using the Group Sunspot Number Reconstruction". Solar Physics 205(2), 383-401. ^ The Sun: Did You Say the Sun Has Spots?. Space Today Online. [12 August 2010]. ^ SIDC Monthly Smoothed Sunspot Number. "" ^ What's Wrong with the Sun? (Nothing) more information: Spotless Days. "" ^ Solaemon's Spotless Days Page. ""